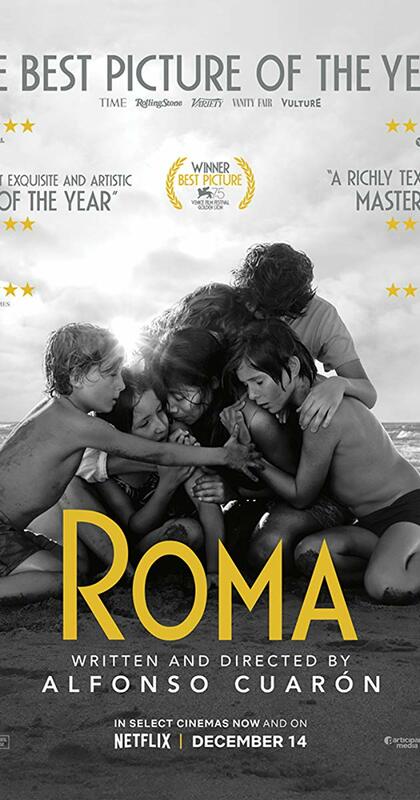 With a relatively small budget and a vision that bursted with passion, the black and white film Roma was able to maneuver its way into the spotlight on the last month of 2018. The Netflix Original is directed by Alfonso Cuaron, a Mexican director renowned in both Latin and North America. By utilizing a picturesque cinematographic style, Cuaron was able to produce a film with a histrionic storyline that is veritably captivating to many. The movie, which is based on Cuaron’s childhood, takes place in Mexico City during the 1970s. The main conflict revolves on the relationship of Cleo, a middle-class family maid and one of the kids she cares for, Pepe. A contrast between the two characters is formed throughout the unfolding of the story as they both face opposite societal obstacles of similar magnitudes. One side of the film focuses on the labor of Cleo and the wrongdoings of her social life, while the other side concentrates on Pepe’s family problems and how it shapes him despite his young age. Both challenges ultimately cross paths and give the audience a clear understanding that Pepe might just be Cuaron’s young self, intending to portray the permanent impact that a family maid had on his early life. Cleo was played by Yalitza Aparicio, a young native of Oxacana, Mexico. She landed the movie’s main role despite having no previous acting experience, a role she impressively embraced from the beginning scene to the end credits. However, she did it with the help of Marco Graf who plays Pepe. By either following the script or going full-on improve, the two amazingly illustrated their bond as friends despite their bordering lifestyles. Aparicio proved to the film industry that a great film school degree doesn’t guarantee success in a film, it’s the pride of wearing that role that produces a beautiful act. Despite having a relatively small budget, the movie did not miss any key components that make it worthwhile. Everything from aesthetics to storyline was incorporated into the two-hour length of the film. It is these attributes that have made the “Roma” a contender to be part of this February’s Oscars and hopefully make history as the first Netflix Original to be nominated. The audience to be most captivated by “Roma” would have to be the hardworking immigrants of this country and those who have experienced the breaking of a relationship. The storyline is founded on the theme of fighting for a better future by building from past mistakes. The movie is R-rated as some scenes do contain content that is inappropriate for younger adolescents, nevertheless skip the one sexual scene and the birth scene, and the movie will be suitable for your family to enjoy. My name is Anthony Vallejo and I write for the Arts and Entertainment section. I like to consider myself as a photographer, filmmaker and a tourist of my own city. Going out and exploring unfamiliarities is one of my hobbies which is why I’m excited to show you all the hidden gems of the Big Apple though my lens.